How do I make animation transitions a one-way street? I am making a platformer. 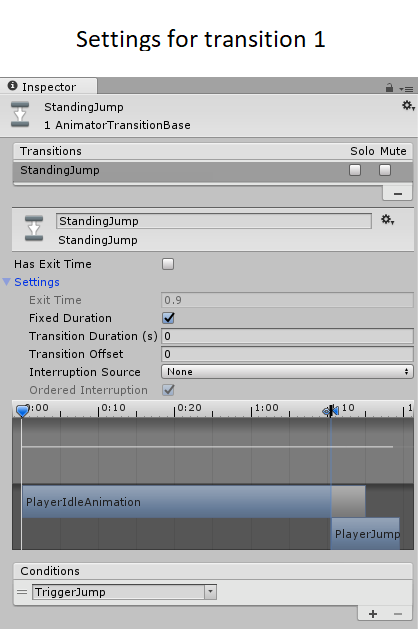 I have already set up idle and run animations for the player, and I've imported them all into an animation controller. There are some other animations, but I'm going to focus on the two states that are inside the red box. Transisition 1 is the jump event, Transition 2 is the landing event. When the player hits the spacebar and is touching the ground, I set the TriggerJump trigger, and when they land again, I set the TriggerOnGround trigger. My animator is set up properly in my code, as the idle -> running and running -> idle transitions work fine (they're boolean). The way I THOUGHT these triggers worked was that in once you call a trigger and a transition from one state to another occurs, you are stuck in that state until some other trigger gets it out of there. There is only one place in my code where I call TriggerOnGround, so I've set a Debug.Log() there to show whenever this is called. So after all that setup, here's my problem. As soon as I hit the spacebar, the player quickly flashes to the jump animation then immediatly back to the idle animation. My above mentioned Debug.Log() shows nothing, so the TriggerOnGround event cannot be getting called, so somehow this animation controller is getting from the jump state to the idle state without my manually calling TriggerOnGround. What's happening is the transition is backing up on itself, and I don't know how to prevent it. 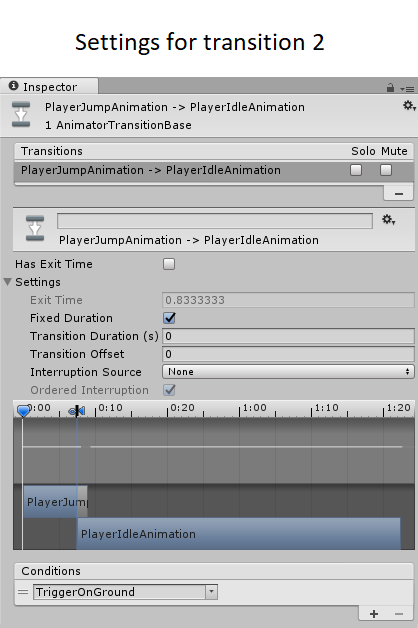 If I mute every other transition in the scene except for transition 1, then there should be no way to get out of the PlayerJumpAnimation state. However, even when I mute all other transitions besides 1, I am still seeing this exact same behavior. That means that the state machine remembers it's previous state, and the transition it took to get there. When the trigger is activated, it goes through the transition from Idle -> Jumping, and when the trigger is set back to false interally, it goes BACKWARDS through the transition to the original state. Is there some way to prevent this backup from happening? I want these transitions to be one-way streets.